Will GE14 be the next catalyst for the property market? MANY expect clarity to the political landscape in Malaysia after the 14th General Election (GE14) which will be held next week. Similarly, hopes hang high for the political resolution to rouse the slumbering property market. So, will the market pick up after the general election? Well, you can keep your fingers crossed. A look at historical data from the National Property Information Centre (Napic) showed that previously, such as during the 1999 and 2004 general election years, the market recorded significant increases in both transaction volume and value. In 2008, 340,240 properties valued at RM88.3 billion were sold. Compared with the previous year, this annual growth rate in volume slowed to a single digit at 9.9%, while the total value increased 14.5% y-o-y. However, in the 2013 general election, transaction volume slid 10.9% y-o-y to 381,130, although transaction value climbed slightly by 6.7% to RM152.3 billion. Sunway University Business School professor of Economics Dr Yeah Kim Leng tells EdgeProp.my that the impact of the general election on the property market will be transitory, depending on the government’s future direction and housing policies. “Any change in the government’s development direction will have an impact on people’s income, consumer sentiment and spending power, as well as investors’ confidence on our economic outlook,” he notes. Despite the significant movements observed in the previous general election years, Yeah says one shouldn’t ignore the performance data preceding the election years, rather than just take the performances as a generalised election pattern. 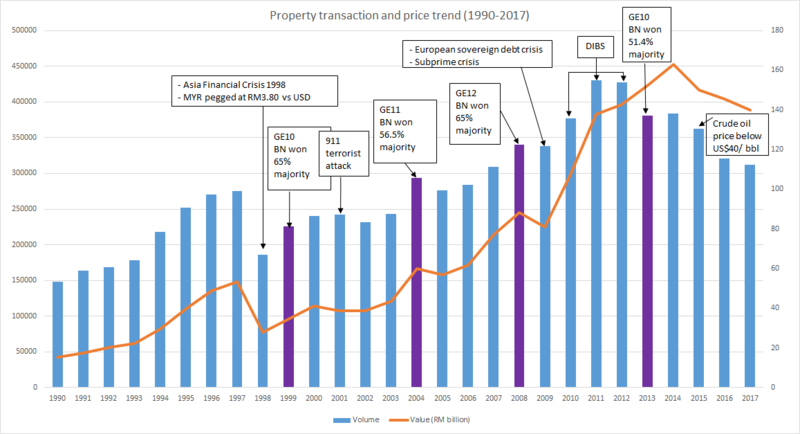 “For instance, the jump in transaction volume and value in 1999 were mainly due to the low base effect as Malaysia was caught in the Asian Financial Crisis of 1997, where all economic sectors including the property market were severely impacted in 1997 and 1998,” he explains. According to Napic data, property transactions in 1998 plunged 32.3% y-o-y to 186,080 cases, while transaction value fell by almost 48% to RM27.9 billion. Between 2001 and 2002, major events such as the 911 terrorist attacks, dot-com bubble burst and a US economic recession impacted global trade activities. Similarly, the Malaysian property market experienced a downturn as transaction volume and value showed flattish or negative growth during this period. “The uptick of sales performance in 2004 was a continuation of the market rebound in 2003, after two years of slowdown,” says Yeah. On the other hand, RHB Research Institute Sdn Bhd senior analyst Loong Kok Wen notes that there may be many new launches after a general election because most buyers tend to decide after the dust has settled. “The upcoming general election and our expectation of another 25bps rate hike for the remainder of the year are key headwinds for the sector. Similar to the last general election, while developers hold back their launches, buyers are likely to delay their purchases until after the polls,” she explains. In contrast, real estate consultancy firm Savills (Malaysia) Sdn Bhd’s executive vice-president of research and consultancy Lek Chay Tong opines that general elections normally will not have a direct impact on the property market as genuine buyers will still purchase the property eventually. “Political certainty is the main concern for investors, but for genuine buyers, we have observed that buyers’ confidence have [currently] returned as there are plenty of choices with lots of attractive offerings in the market. It will just be a timing problem for the genuine buyers to make their purchase decision,” he adds. On fluctuations in property market trends, Lek says it is natural for the market to react to economic conditions, including crises which impact overall economic performance. “Many reasons affect house prices and the general election would seem to have minimal impact on home purchase decisions. House price growth and transaction volume in the secondary market are usually affected by various contributing factors such as the condition of the house, existing and future public transportation, economic and consumer sentiment as well as bank lending policies,” he adds. 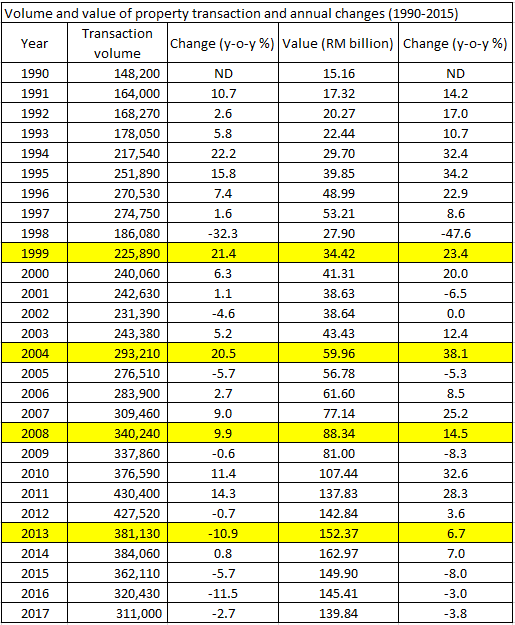 He notes that a general election may more likely have an impact on the investment market rather than for homebuyers. “A potential change in the political landscape adds a degree of risk and uncertainty to the property market, particularly in prime locations such as KLCC, Bangsar and Mont’Kiara. This will result in transactions being held back for big ticket items like enbloc sales,” explains Lek. Besides this, urbanisation and population growth will spur housing demand, thus pushing up construction cost and the prices of land and property. 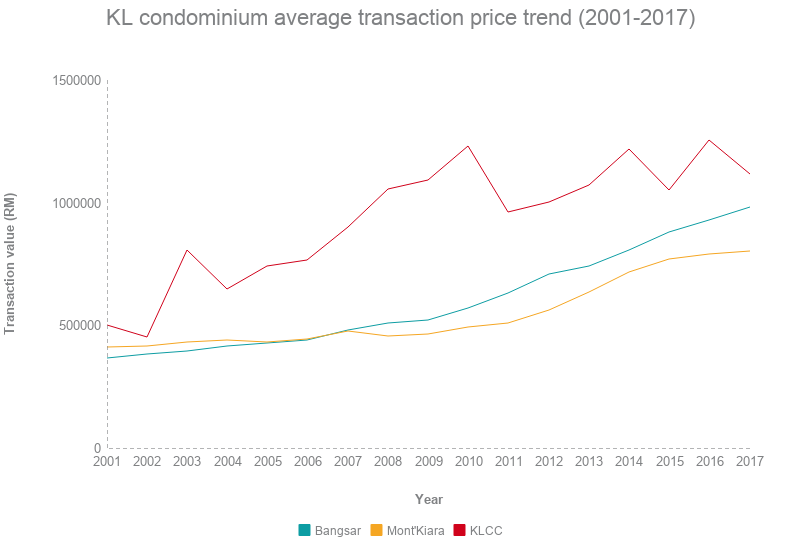 For instance, condominiums in KLCC, Mont’Kiara and Bangsar had witnessed significant price increases between 2007 and 2017. Data collated by Savills Malaysia showed that the average selling price of condominiums in KLCC had increased 24% to RM1.11 million from RM898,750 back in 2007. Bangsar’s condos saw transaction prices jump by 110% to RM980,000 in 2017 from RM480,667 in 2007. Meanwhile, average prices of Mont’Kiara condos were RM800,000 in 2017, up 68.2% from RM475,667 in 2007. Lek adds that high-rise residential property prices might fluctuate over time, depending on market supply or housing policies, but landed properties show a clearer picture of housing price trend due to land scarcity and stable demand. 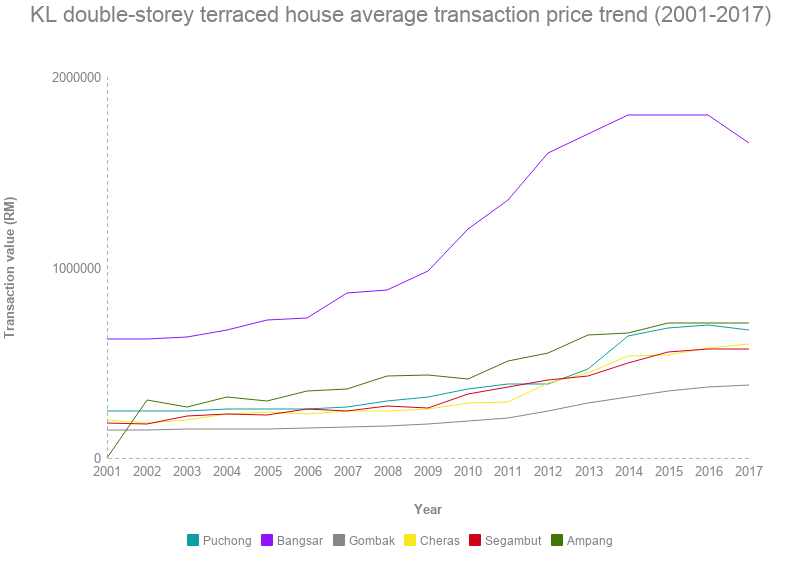 For landed properties, data over a 17-year period from Savills Malaysia show that transaction prices of double-storey terraced houses in Puchong, Bangsar, Gombak, Cheras, Segambut and Ampang KL have appreciated over 100% from 2001 to 2017. The top three areas which have enjoyed the highest capital appreciation are Segambut, Cheras and Puchong of between 174% and 200%. Segambut saw the average selling price of double-storey terraced house increase 200% to RM571,500 in 2017 from RM178,500 in 2001. Cheras and Puchong recorded price increases of 197% and 174% respectively. Bangsar double-storey terraced houses appreciated by 166% to RM1.65 million from RM620,000 in 2001, while average transacted prices of those in Gombak rose 162% to RM382,500 from RM145,500. Ampang KL’s average selling price of double-storey terraced houses surged 133% from RM303,000 in 2002 to RM707,000 in 2017. Regardless of the general election results, market observers do not expect a major change in the main direction of housing policies as affordable housing continues to be the key theme. Sunway University’s Yeah notes that after the property market boom between 2011 and 2014, the market has become more segmented as developers offer a wide range of choices, price range and products, to cater to different customers’ needs. “Generally, from a macroeconomic perspective, as long as people stay employed, they will continue to buy,” he says. Unlike robust trading activities during boom times, where property transactions easily fetched double-digit high growth, the property market has now rebalanced and is moving towards a healthier market with sustainable growth, in tandem with wage growth. “With slower growth in housing price and a stable economic condition, the majority of wage earners can now look for suitable houses with prices within their means,” he explains. As the market changes, developers are also moving to the same direction by offering different products to different customers in different salary ranges, which will improve current market dynamics. He notes that there are still pockets of demand for medium-range products which are not being fulfilled and there are developers ready to tap into this segment. RHB Research Institute’s Loong foresees more affordable housing schemes being introduced by the government and local authorities. Private developers will continue to join the bandwagon by introducing competitively-priced products to attract buyers. “The increasing supply of affordable housing is favourable for the working class who lament of unaffordability, but it also means in coming years, the market will see a glut of affordable housing,” she explains. Furthermore, Loong is worried that the inflation rate will increase significantly post-general election, as consumer goods prices, such as petrol, and mortgage interest rates, might rise after the election is over. “The potential OPR (overnight policy rate) hike may also hit consumer sentiment, as interest costs on mortgages are likely to become more expensive. A rising interest rate environment is generally unfavourable for real estate prices as well,” she adds. Loong expects sales growth to be flat this year, likely seeing 0% to 3% increase as the industry continues to consolidate. According to Napic data, Malaysia has recorded 311,000 transactions worth RM139.84 billion in 2017, a y-o-y marginal decrease of 2.7% in volume and 3.8% in value.